As you read this I am somewhere between Port Canaveral, Florida and Disney’s Castaway Cay Caribbean island on the Disney Dream cruise ship. I could not leave without a little something to remind you of my latest photo assignment on Food Photography. With apologies to anyone who resolved to go on a diet for New Year’s. I present the dessert bar from Chef Mickey’s restaurant in Disney’s Contemporary Resort. The dessert bar at Chef Mickey's restaurant in Disney's Contemporary Resort. Nikon D700/28-300VR, 1/125s, f/5.6, ISO 720, EV -0.3, 28mm focal length, flash bounced off HIGH ceiling at full power. 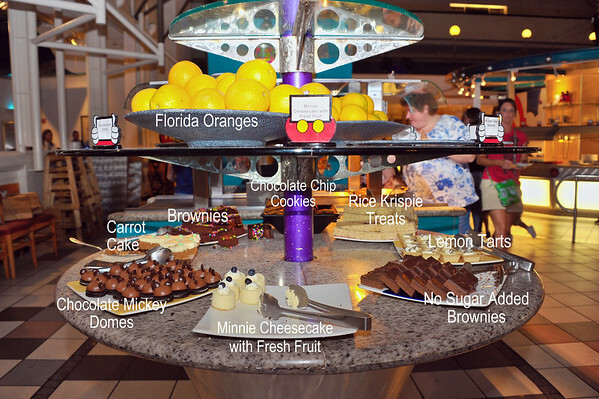 This entry was posted in Travel and tagged bar, brownies, cake, carrot, cheesecake, chef mickeys, contemporary, dessert, florida, lemon, oranges, orlando, resort, restaurant, rice krispie treats, sweets, tarts, walt disney world, yum. Bookmark the permalink. I can’t believe you didn’t bring me home a chocolate Mickey Mouse Dome! Everything looks so delicious, this is Lee’s kind of breakfast. Those chocolate Mickey domes look right up my alley! !